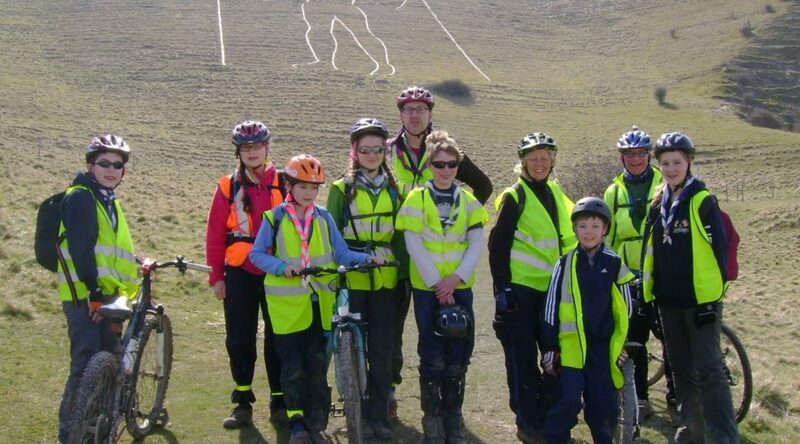 Scouts from 4th Sevenoaks tackled a 70 km off-road cycle expedition this weekend, taking them from Mayfield to Herstomonceux and Wilmington. The first day they started their journey near Mayfield, following a muddy bridleway from the bottom of the valley up past the TV mast to Heathfield and then a smooth downhill 10km along the Cuckoo Trail through Horam to Hailsham. They finished the first day with an extremely muddy loop along the appropriately named Marshfoot Lane to the Observatory at Herstmonceux before reaching Bushy Wood Scout Camp late in the evening. Dinner was a huge plate of chile-con-carne followed by cake and custard before retiring for a well earned rest. Never have a group of scouts fallen asleep so quickly! After a refreshing night’s sleep with only a little frost on the ground they cycled from the camp site on a great cycle path through Wilmington wood to a lunch stop below the Long Man of Wilmington. They crossed the hill on a bridleway that ended in a flowing descent that took them to Polegate. The expedition ended with the group cycling north back up the Cuckoo Trail to Horam. “I can’t believe we did it! I have never ridden through so much mud“, exclaimed Elizabeth. The whole trip punctuated (!) by many tyre changes, that by the end of day one everyone was getting pretty slick at it, and tender ‘saddle regions’ – apparently the minibus seats have never seemed softer. Congratulations to Kelly, Riana, Elizabeth, Francesca, Matthew, Sam and William and thanks to Paul, Sheila, Michael and Duncan. See the bottom of the post for the map of all 70 kms! Getting slick at puncture repair. Even the scenery was no match for a lie-down by lunchtime on day two. Panorama from the base of the Long Man of Wilmington while out with 4th Sevenoaks Scouts on a cycle expedition.